Anuradhapura: Among The Giant Stupas | What an Amazing World! In the scorching heat of early June – one of the hottest months in a year, my driver, Suresh, skillfully drives the old non-airconditioned minivan through every turn and crossroads of Sri Lanka’s intercity highway. He has been doing his job for more than ten years now, hence the unrivaled knowledge of Sri Lanka’s interesting places. This time he is taking me to Anuradhapura, the country’s oldest continuously inhabited city – since 10th century BC – and the most prominent site for Sri Lankan Buddhist pilgrimage. We are just two days away from an important national holiday celebrating the arrival of Buddhism to the country. Signs of preparations for the special day are evident. Countless flags of Theravada Buddhism – stripes of red, yellow, blue and white – are hoisted everywhere. Upon approaching Anuradhapura the smooth asphalt road turns into dirt and gravel, under renovation and scheduled to be completed before the holiday. 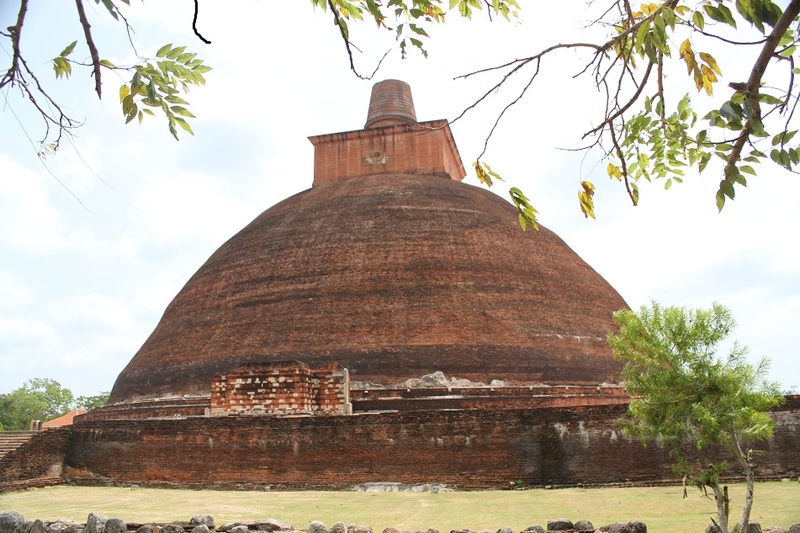 Arriving at Anuradhapura, a gargantuan bell-shaped red-brick dagoba (Buddhist stupa) welcomes me. It is Jetavana Stupa, a part of Jetavanarama monastery which was built in the 3rd century AD. 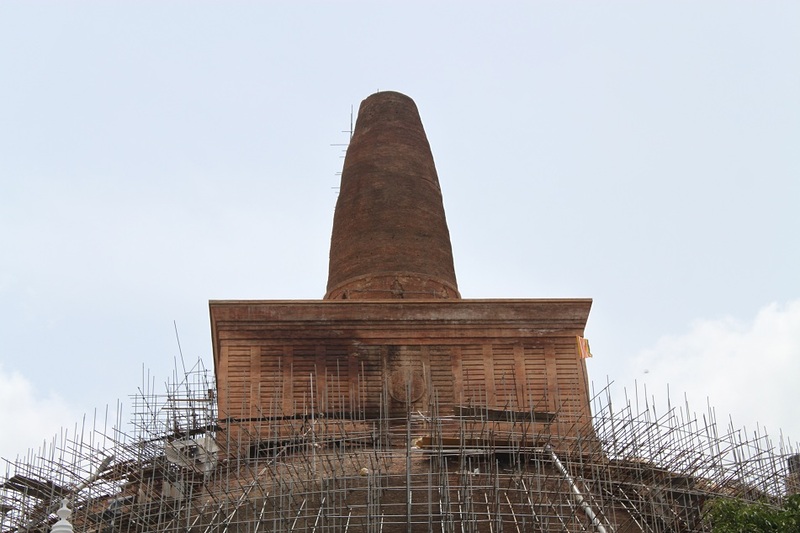 Purportedly the tallest brick structure in the world during its heyday, Jetavana stupa still retains its grandeur despite the crumbling exterior, revealing thousands of weathered bricks prone to further erosion by the elements. It is in utter silence where I am one of the only few visitors. Respecting the tradition, I take off my shoes upon entering the stupa’s mid-level where pilgrims circle the perimeter of the giant structure. 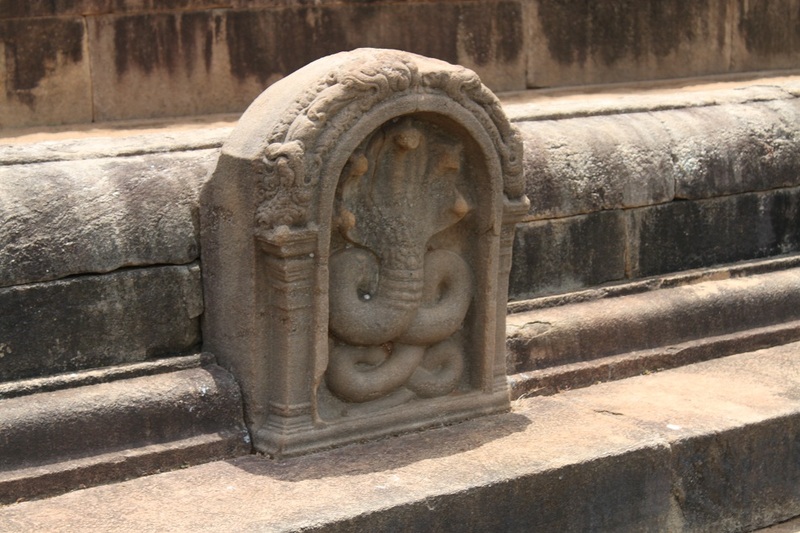 Rather plain in decoration, Jetavana stupa only contains a few carvings depicting Boddhisatvas and elephants. 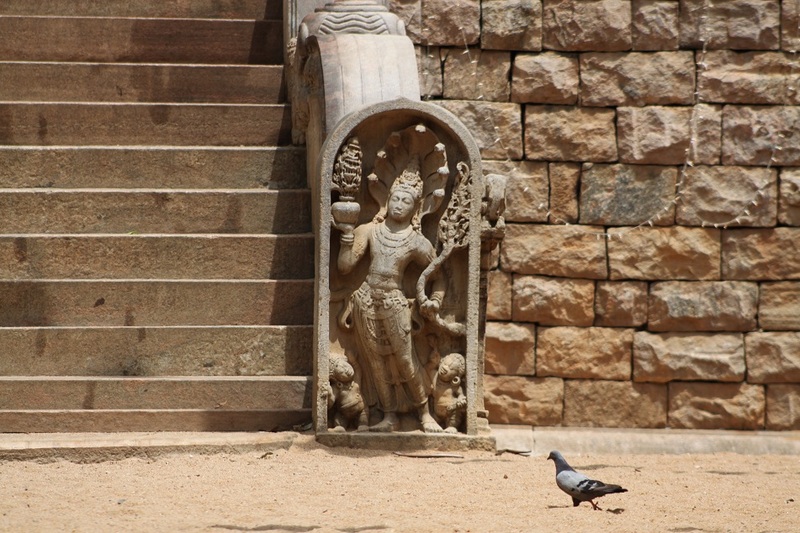 Anuradhapura was once the capital of Sri Lanka from the 4th century BC to the 11th century AD. Among other ancient cities in the Cultural Triangle, it is arguably the most important one – hosting some of the country’s most venerated Buddhist sites. Kuttam Pokuna or The Twin Ponds is one of the most visited ancient sites in Anuradhapura. 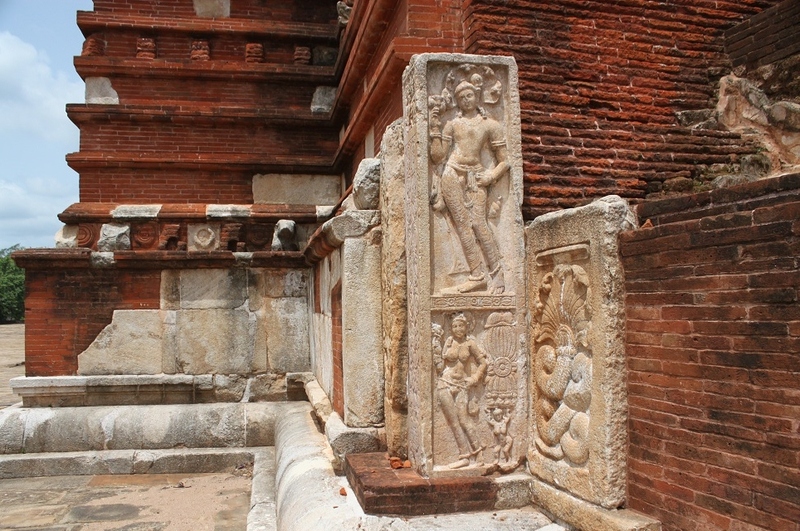 Lacking the sheer splendor of other nearby sites, Kuttam Pokuna is in fact considered a significant technological achievement in ancient Sinhalese community. 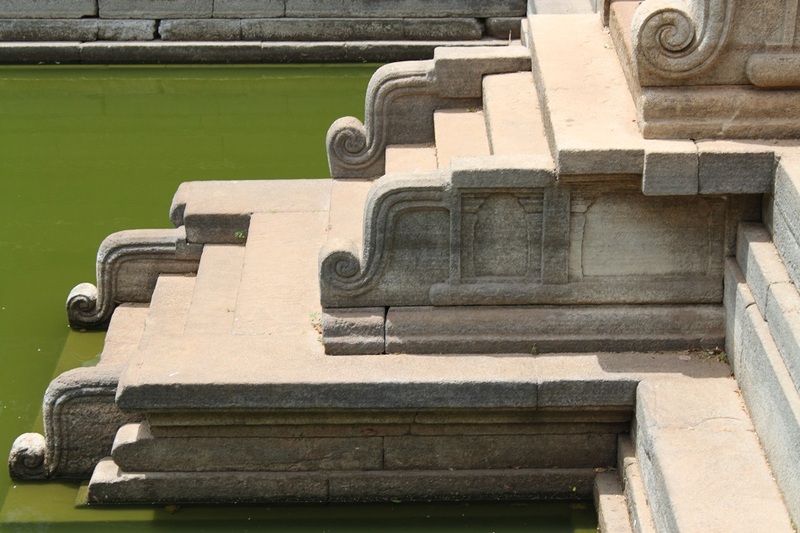 Slabs of cut granite and carvings of naga and other decorative elements on the steps are some architectural features of the ponds. Not spending too much time at the ponds, we continue the trip to the next site. Suresh navigates his car through dirt roads and bushes, again showing his ample knowledge of this area. After passing through some trees with protruding branches which block my view, we arrive at Abhayagiri Monastery, another gigantic dagoba in Anuradhapura covered in wooden scaffoldings due to a renovation work. Unlike at Jetavana Stupa, I see more people in this place, some are pilgrims, the others are visitors like myself. Because of the apparent religious activity being conducted there, I decide not to wander around the stupa to respect the devotees and let them pray peacefully. In his effort to ease my slight disappointment, he takes me to Ruwanwelisaya, another giant dagoba in this arid plain. Different from the previous two dagobas, the flawlessly painted white dagoba of Ruwanwelisaya is filled with hundreds of pilgrims. Under the colorful Theravada Buddhism flags hung above the pathway by thin wires, I walk reluctantly toward the dagoba while always making sure I do not do anything that can disturb the pilgrims. However, it is a gray langur sitting on a pedestal near the entrance to the dagoba that steals my attention. Not long afterward, others come and join him watching passersby while at the same time hoping to get some food. Next to me a small group of Italians are also distracted by the langurs and spontaneously all of us take out our cameras at the same time. Realizing that Suresh has been waiting for me in his car for several minutes on this very hot day, then I rush to Sri Maha Bodhiya, the last place I visit in Anuradhapura. 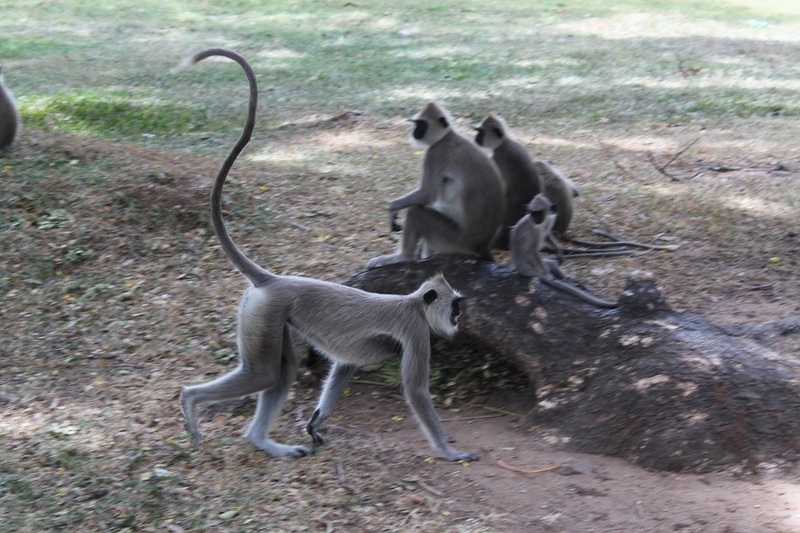 It is a relatively short walk from Ruwanwelisaya and along the way more gray langurs are spotted with some water buffaloes roaming around them. Sri Maha Bodhiya is said to be the oldest surviving Bodhi tree – a sacred tree in Buddhism – in Sri Lanka, dating back from 288 BC. Noticing some pilgrims are praying on the ground near the tree, I take no more step to get closer to it and choose to keep a courteous distance from them. Despite the crowd, the atmosphere at this place is unbelievably serene where everyone seems to be preoccupied with the prayers. Going back to the car to see Suresh, I walk with an even higher excitement and anticipation for exploring more of Sri Lanka’s ancient sites. With the big national celebration approaching, I only have so limited time to explore the country’s Cultural Triangle without having to jostle with hundreds or even thousands of pilgrims. Truth be told, I had never known of Anuradhapura until you mentioned it earlier on. It really does look like a serene place of pilgrimage. That photo of the white stupa – it almost seems to fade into the clouds! And I had only learned about it a few months prior to my departure to Sri Lanka. If it was not because of the holiday, I’m sure the place would feel so much more serene. I’ve been told by my driver that Anuradhapura is like the Mecca for Sri Lankan Buddhist pilgrims, and that white stupa is the center of the commemoration. Truly a special place. South Asia and Southeast Asia share many cultural aspects due to their historical ties. I’m glad you enjoyed the post, Bhaven! and I really want to go to India one day.. Thank you so much for the grand tour of your trip! Enjoy reading the history of SL. Great pics! 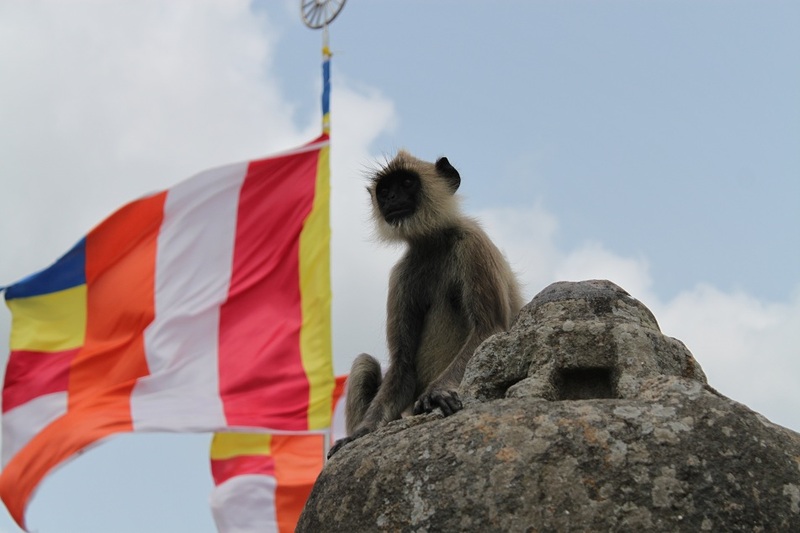 He was right about the crowds around Anuradhapura, Bama. The monk said they have 2 million visitors to Mihintale over the week of Poson poya – that being the supposed anniversary of the introduction of Buddhism to Sri Lanka, in the little glade beneath the three rocky peaks at the top of that hill. If you go to http://thedepartureboard.com/picture-the-world-sri-lanka you can see what it looks like today. 2 million??? Wow, I’m glad he told me beforehand. Otherwise I would have been stuck in the traffic or among the crowds. Btw it looks so different from what I saw two months ago. So serene and surreal. Nice choice for the Picture The World project, Meredith! i know, the crowds would have been dire, but I’ve always thought it would be an amazing place to be, among all those pilgrims, at Mihintale on Poson poya day. I was there just after dawn – the light was amazing as I climbed up toward the grove, and was still low, casting shadows onto the little dagaba like a projection screen. Glad you liked it Bama. Thanks. Beautiful photos Bama! 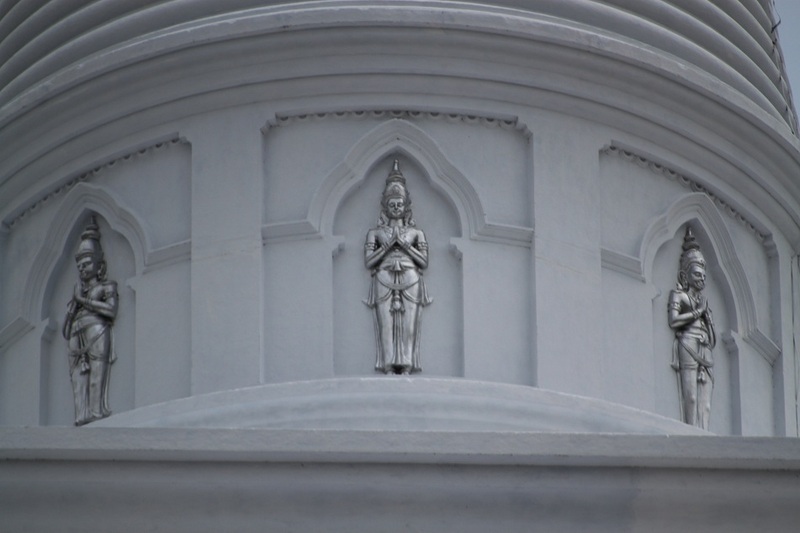 Particularly the white dagoba of Ruwanwelisaya. Thanks Madhu! Ruwanwelisaya is a very special place indeed. I’d really never known about this place since you posted it here… What a great place!!!! Thank you for such beautiful and vivid description of Anuradhapura. It’s somewhere I hadn’t known of before, and now I think I would like to go there. I’m glad you enjoyed the post, Denise! 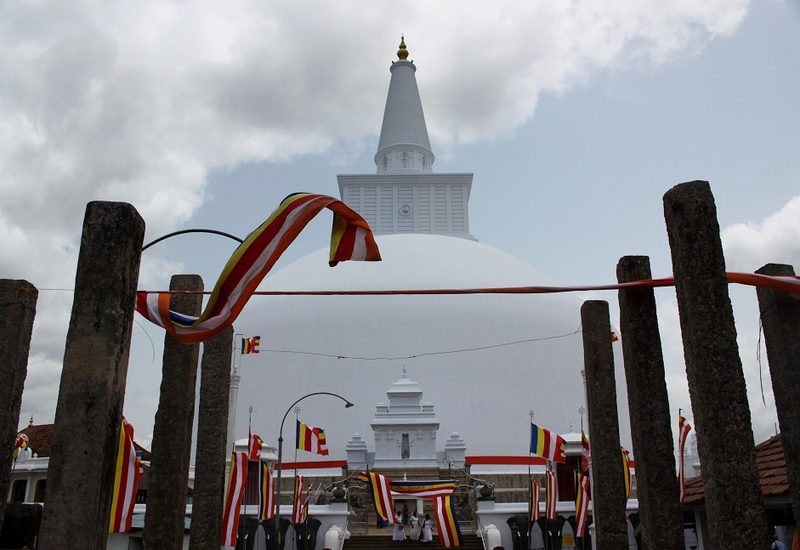 Anuradhapura is only one of Sri Lanka’s most interesting sites. I don’t mind going back to the country one day. Thanks! Oh they were indeed! I remember one monkey was particularly mischievous and he kept annoying a woman. What a mouthful of a name to say …and eyeful of pleasure in your photos! You’ve had some awesome travels for the year so far Bama! I’ve had fun ‘coming along’ on ur trips! Hopefully our travel paths cross one day in the future! I will be really excited if one day we bump into each other in some random country! “The shape of the stupas in Borobudur is not unlike that of stupa in lotus style of Anuradhapura. I also remember being struck by the resemblance between two statues of Buddha discovered in the ruins of Abhayagiri of Sri Lanka and the statues at Borobudur. The thesis of some archaelogists is : most probably the important buildings as Candi Borobudur, Candi Mendut and Candi Lara Jonggrang (prambanan complex) were designed in Nalanda of India or Abhayagiri of Sri Lanka which has a proof connection to Shailendra Buddhist Dynasty. Do you have the same impression like Mr. Hattori in Anuradhapura, even at glance ? Sorry if it’s too looong…..
Wowww! Those are some theories I’ve never heard of. It’s always interesting to find out how interconnected we had already been centuries ago. Thank you so much for sharing the valuable information! Actually there’s another temple in Java which fascinates me: Candi Penataran. 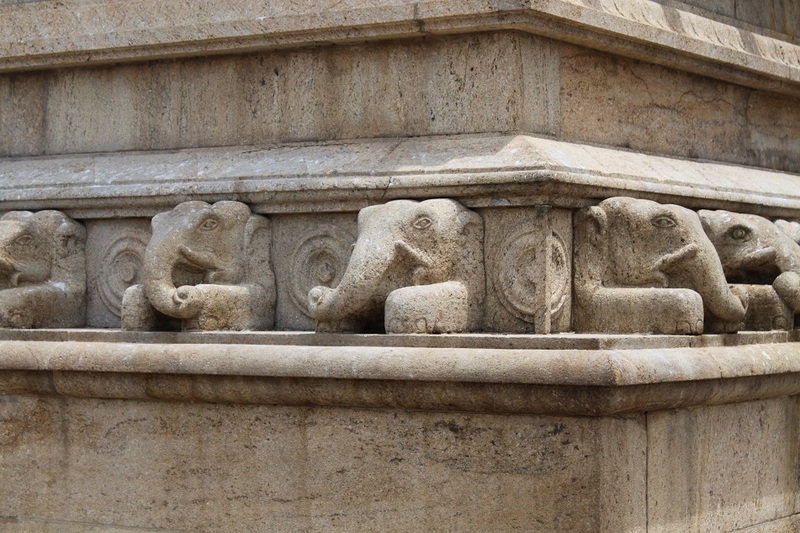 It has some reliefs which look similar to those found in Mayan temples. It’s quite understandable about the cultural connection between Indonesia, India and Sri Lanka. But it would be harder to explain the connection between Java and the Mayan civilization. I heard it, but still in big debated. Same as Phantom Voyager book. If the austronesian can explore until easter island of Chile, it’s also possible they can across to south america. Why the Baksey Chamkrong Temple in Cambodia also looks similar with Tikal Mayan temple ? That reminds me of Kon-Tiki and the reason behind the expedition. The world is truly full of mysteries yet to be found. Nice clicks Bam, especially that beautiful mural. Is that a new or old murals, since the colors are still vivid enough? Thank you, Bart. I believe those murals were quite new. 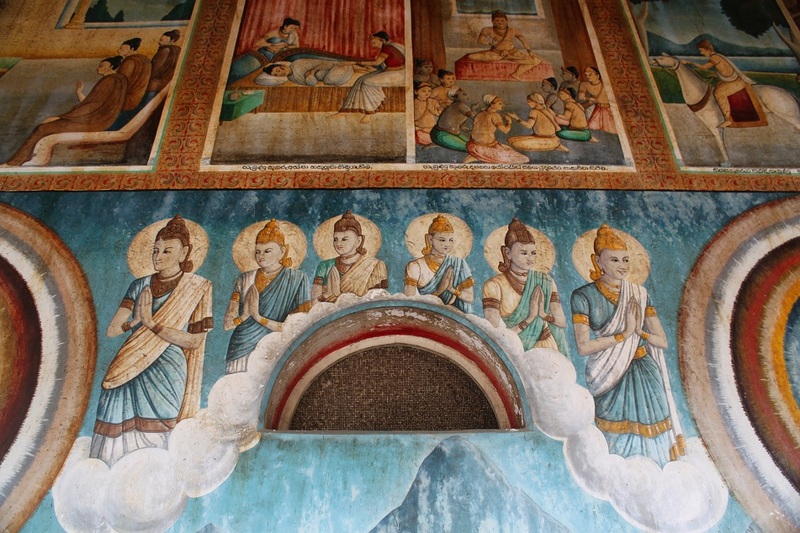 It’s the murals at Sigiriya that you really need to see. They’re amazingly beautiful!